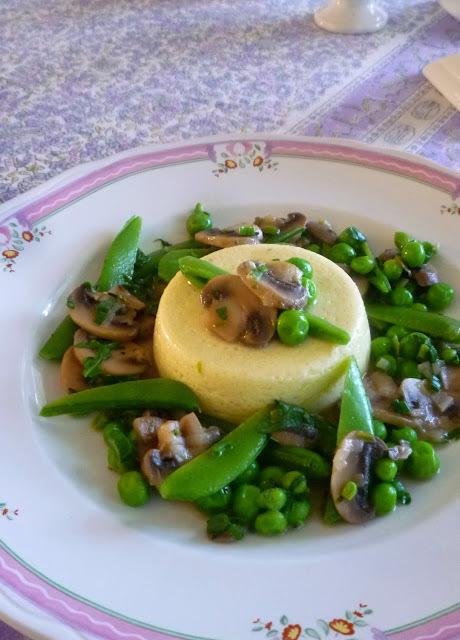 I'm not sure if I first bumped into Parmesan Pudding in Joyce Goldstein's wonderful little book Solo Suppers or in Suzanne Goin's Sunday Suppers at Lucques. It could have been either one...both books are favorites. I turn to Goin's book for professional inspiration on a regular basis. I use Goldstein's as more of a treasure trove for the kinds of things I like to eat when I'm cooking at home. Parmesan Pudding, as it happens, is useful in both situations. I have served it to clients as part of an elegant entrée (with chicken and a medley of spring vegetables, for example)...and we enjoy it at my house as the centerpiece of a light dinner...with a seasonal vegetable ragoût...or a simple salad. It is a delicious little preparation to have in your repertoire. With a Salad of Arugula, Sugar Snap Peas, Black Olives & Walnuts. No matter how you choose to think about it...or what familiar preparation you choose to compare it to...I think you will find it to be delicious. 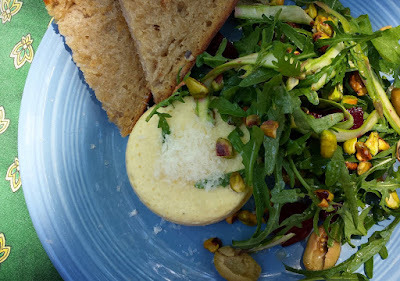 It is rich, creamy and very savory. I love it in this plain cheese form, but Goldstein writes that in Italy it is most often made with an addition of a vegetable purée of some kind. Goin suggests the additions of sliced prosciutto or cooked asparagus or sautéed mushrooms...all of which sound delicious. I can imagine all kinds of possible vegetable additions. However, I prefer to make it in its plain form...choosing to add other flavor elements as a sauce or garnish. 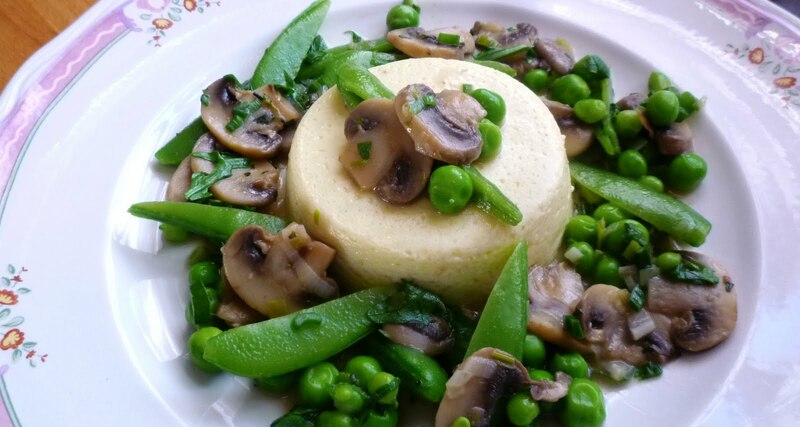 The medley of mushrooms, peas and spring onions that I am posting is a perfect go-with. In late summer ratatouille would be good...or a sauté of peppers and prosciutto. In the fall and winter months a sauté of wild mushrooms (with some white wine...fresh herbs...and maybe some prosciutto) would be just the thing. And I have to admit that since I love mushrooms combined with winter squash that this would be a great time to make your sformato with the addition of some winter squash purée. 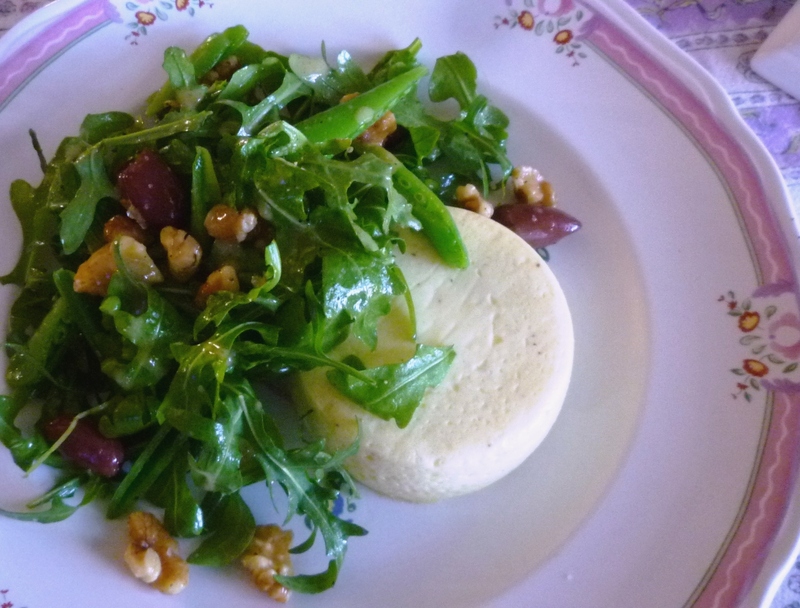 If you want to go with a lighter garnish, sformato is delicious accompanied by some crusty bread and a simple salad (just greens...or greens with a few vegetables and maybe some toasted nuts...and olives...). The recipe that I am posting today is Joyce Goldstein's version. It is for individual-sized puddings...but you can bake the mixture in almost any container you like. It can be baked in a loaf pan...and then turned out and sliced....or in a shallow gratin, in which case you could turn it out and cut it into wedges, or do as Goin does and simply set the gratin on the table and let everyone help themselves to a big spoonful. Once you try it, you will definitely want to make it again...and you will, I am certain, come up with lots of delicious ways in which to serve it. 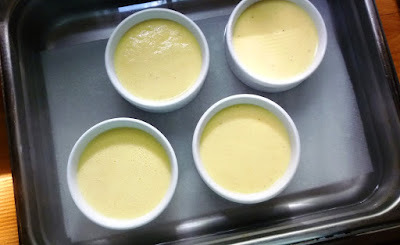 Butter individual soufflé molds and line with a round of parchment paper. Butter the parchment paper. Set aside. 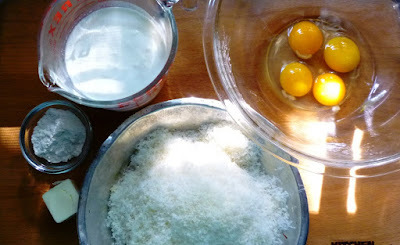 Place the whole eggs and yolks in a medium sized bowl and whisk until smooth; set aside. Prepare a béchamel: In a medium saucepan, bring the milk and cream to a simmer; keep hot. In another saucepan, melt the butter over medium heat. When the foam subsides, whisk in the flour. Cook stirring constantly for a minute or two—the roux will be bubbly and straw yellow. Remove from the heat and pour in half of the hot milk/cream, whisking constantly until smooth—it will thicken immediately. Add the remaining milk/cream. Return to the heat and stir constantly until the sauce returns to a simmer. Whisk the hot béchamel in a thin stream into the eggs. Whisk in the parmesan. Season to taste with salt and pepper. If you like, add a pinch of fresh nutmeg. 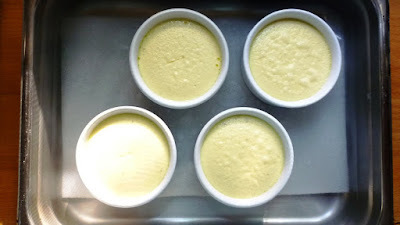 Divide the pudding mixture among the prepared molds and place in a baking pan. Add hot water to the pan to reach half way up the sides of the molds. Cover the pan with foil and bake in a 350° oven until a knife inserted in the center of a pudding comes out clean--about 20 to 30 minutes. Let the puddings rest for 5 minutes. The puddings may be served immediately or made up to a day ahead. If making ahead, cool and refrigerate. Reheat by placing the puddings in a 350° to 375° oven for 15 minutes or so. To unmold, run a small knife carefully around the sides of each pudding. Invert the puddings directly onto a serving plate (make sure that the round of parchment is not attached to the pudding). Serve surrounded by medley of spring vegetables, or other sauce/vegetable medley/salad of your choice. You may also bake the pudding in one large casserole and either turn it out or serve it from the casserole. If you are not planning on turning it out, it is not necessary to line the mold with parchment. Joyce Goldstein suggests adding 2/3 cup of a vegetable purée of your choice in with the cheese for a vegetable flavored sformato. Bring a large pot of salted water to the boil. 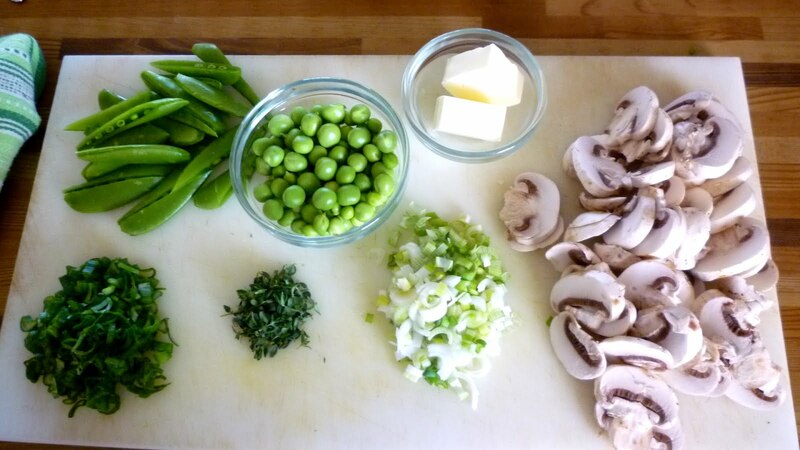 Add the sugar snap peas and cooked until tender-crisp—1 to 2 minutes. Scoop the peas out and refresh under cold running water or in an ice bath. Spread on a kitchen towel. Bring the water back to a boil. Add the shelling peas and cook until just tender. Refresh as for the sugar snaps and spread on the towel with them. Melt butter in a wide sauté pan set over moderate heat. Add the spring onions, mushrooms and thyme along with a generous pinch of salt. Cover and stew gently until the liquid is released from the mushrooms and the mushrooms and spring onions are tender and simmering in a buttery liquid—about 5 to 7 minutes. Set aside until you are ready to serve. Return the pan of mushrooms to moderately high heat. Add a quarter cup of water (you can use the blanching liquid, if you like) or stock. When the liquid comes to a simmer add the green of the spring onions, the peas and sugar snaps and a tablespoon or so of butter. Heat through. If the vegetables seem dry, add a bit more water and butter. When the vegetables are hot, add the arugula. Toss to combine. Season to taste with salt & pepper. Serve immediately. Serves 4 to 5. If serving the ragout with a roast chicken or roast pork, add the pan drippings to the ragout. You may use any mix of green spring vegetable you like in place of the peas and sugar snaps. You will need 8 oz. of trimmed/shelled vegetables. Other good options include fava beans, snow peas and asparagus. You may also use artichokes. Slice them so they roughly the same thickness and size as the cooked mushrooms. Add them to the pan with the mushrooms. After everything has been cooking for 5 minutes, add enough liquid to just cover the mushrooms and artichokes and continue to gently simmer until the artichokes are tender—about 20 minutes. Ragout is also nice with the addition of lemon zest and/or a squeeze of lemon juice.